In Part II we described both the hardware and the process by which attitude data are gathered, transmitted to the attitude software system, and assembled in a manner appropriate for attitude determination. In Part HI we describe the procedures by whichthese data are processed to determine the spacecraft attitude. Chapter 10 introduces the types of attitude measurements and the geometrical meaning of these measurements. Chapters 11 and 12 describe methods for combining as many measurements as there are observables (usually two or three) to produce a single, possibly multivalued determination of the attitude. Chapters 13 and 14 then describe filtering methods to provide optimum estimates of the attitude, given many data points. As discussed in Chapter 1, there are two types of attitude. 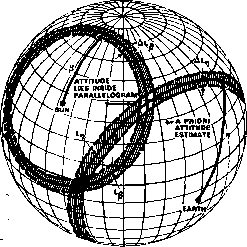 Single-axis attitude is the specification of the orientation of a single spacecraft axis in inertial space. Ordinarily, this single axis is the spin axis of a spin-stabilized spacecraft. However, it could be any axis in either a spinning or a three-axis stabilized spacecraft. Single-axis attitude requires two independent numbers for its specification, such as the right ascension and declination of the spin axis. The attitude of a single axis may be expressed either as a unit vector in inertia! 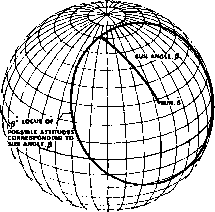 space or as a geometrical point on the unit celestial sphere centered on the spacecraft. (See Section 2.1.) Generally, we will use the vector representation of the attitude for numerical or computer calculations, and the geometrical representation for analytical work and physical arguments. However, because of the direct correspondence between the two representations, we will often move back and forth between them as convenient for the particular problem. If the orientation of a single axis is specified, the complete spacecraft orientation is not fixed because the rotation of the spacecraft about the specified axis is still undetermined. A third independent attitude component, such as the azimuth about the spin axis of a point on the spacecraft relative to some object in inertial space, completely fixes the inertial orientation of a rigid spacecraft. Such a three-component attitude is commonly called three-axis attitude because it fixes the orientation of the three orthogonal spacecraft axes in inertial space. measurements. Measurements concerned specifically with determining the third component in three-axis systems will then be discussed in Section 10.6. Specifying the orientation of a single axis in space requires two independent attitude measurements. 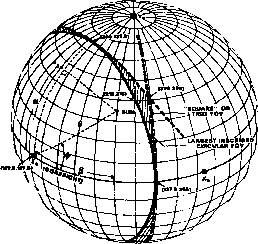 Therefore, if only one of these measurements is known, an infinite set of possible single-axis attitude orientations exists which maps out a curve, or locus, on the celestial sphere. This is illustrated in Fig. 10-1 for the Sun angle measurement, /?, which is the arc-length separation between the attitude and the Sun. Any two attitude measurements are equivalent if and only if they correspond to the same locus of possible altitudes on the celestial sphere.